I had never made Cornish Hens before. There were two in the package and they were much smaller than a chicken. I was busy cleaning and didn’t have a lot of time to spend making dinner at the stove. I wanted something I could just put in the oven and forget about for an hour or so. 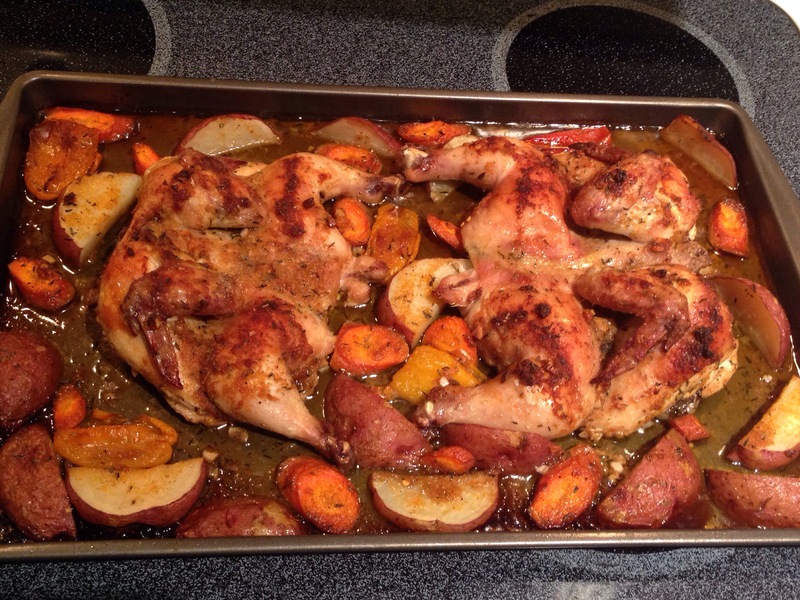 I cut some potatoes, onions, sweet peppers, and carrots, and placed them on a baking sheet along with the hens. I made a rub/dressing with garlic, onion powder, paprika, salt, thyme, olive oil, red wine vinegar, splash of hot sauce, and rubbed everything with it. The house smelled great and before I knew it, dinner was ready! A one-pot dinner. Easy & simple. If you like, you can make a salad to go with it, or some rice. Oh, that looks delicious. 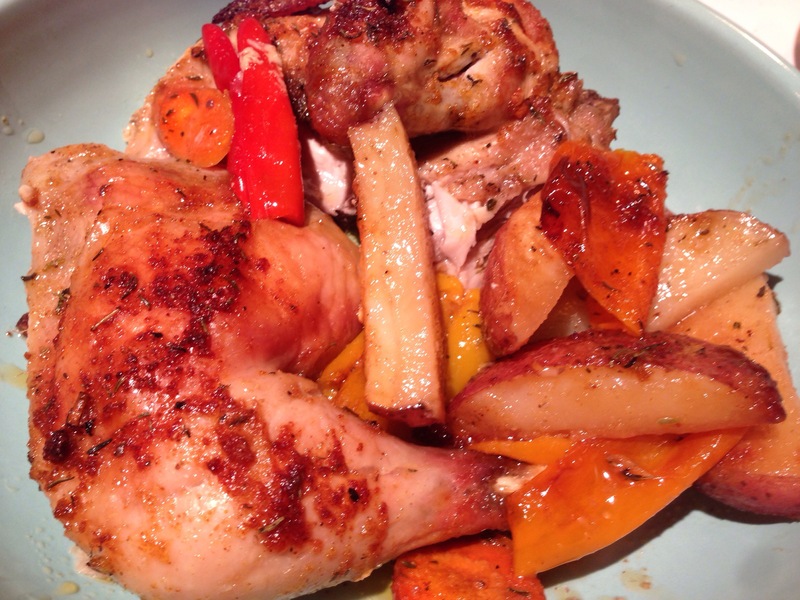 I always think Cornish Hens seem fussy, but this recipe proves they are not. Bookmarking this one! And your sauce sounds amazing! I’m hungry and this looks so delicious with those big colorful chunks of veggies…I wish I had the ingredients on hand! You can also change it by adding your favorite veggies (I just used what I had on hand) and/or adding whatever seasonings you have available. It will probably be just as tasty. 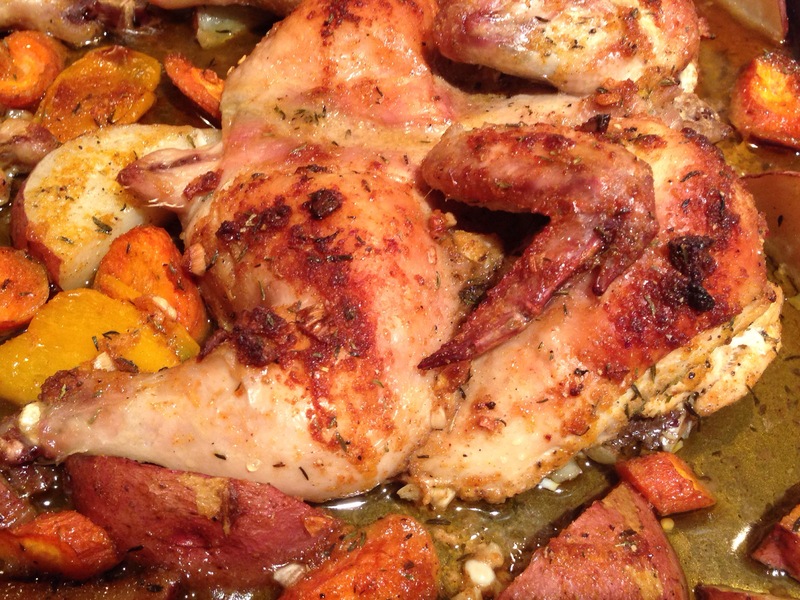 Cornish game hens have been a family favorite for a couple of generations! I can almost smell and taste your version! Yum! 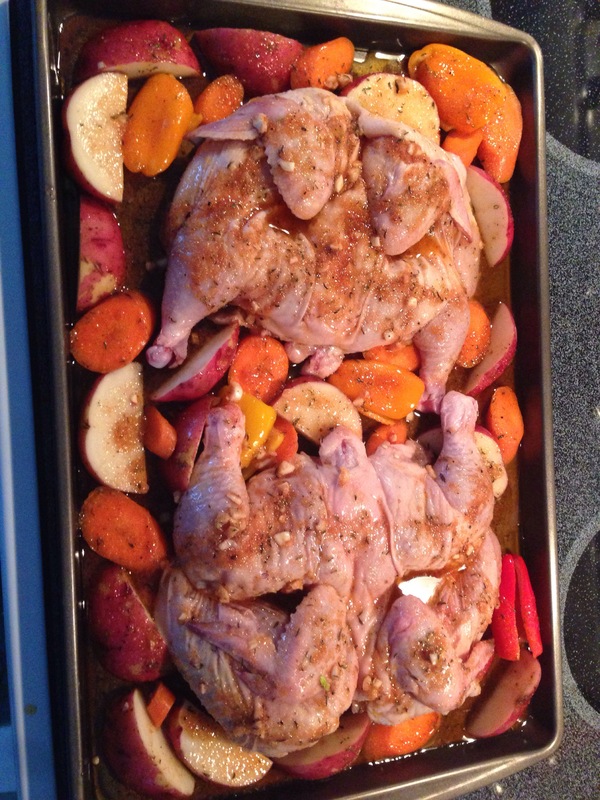 It’s been years since I’ve made Cornish game hens. I’ll have to give them another try. I had always thought they would be expensive, but I was surprised that they were the same price as a roasting chicken at the store where I shop. This looks mouth watering! 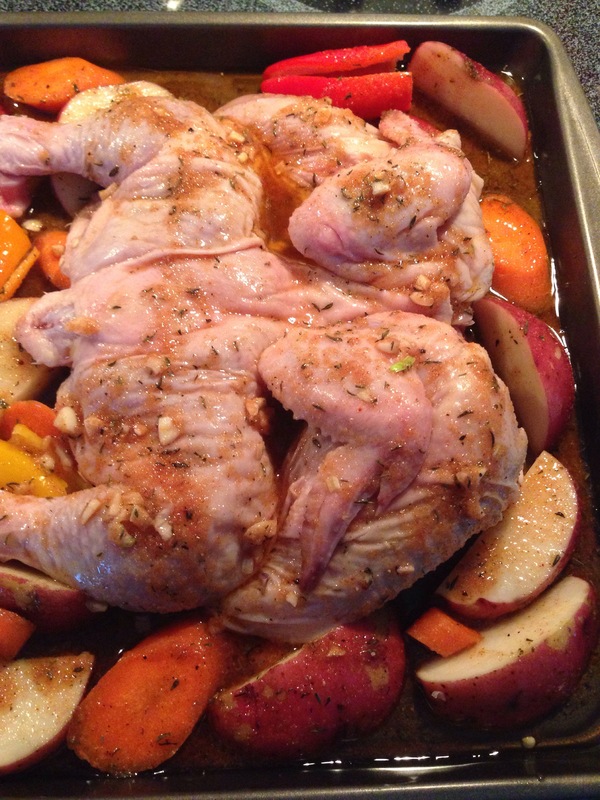 I’ve never cooked Cornish hens.. Thanks Daisy. Great idea! So quick and simple. I like the way you split the chicken. 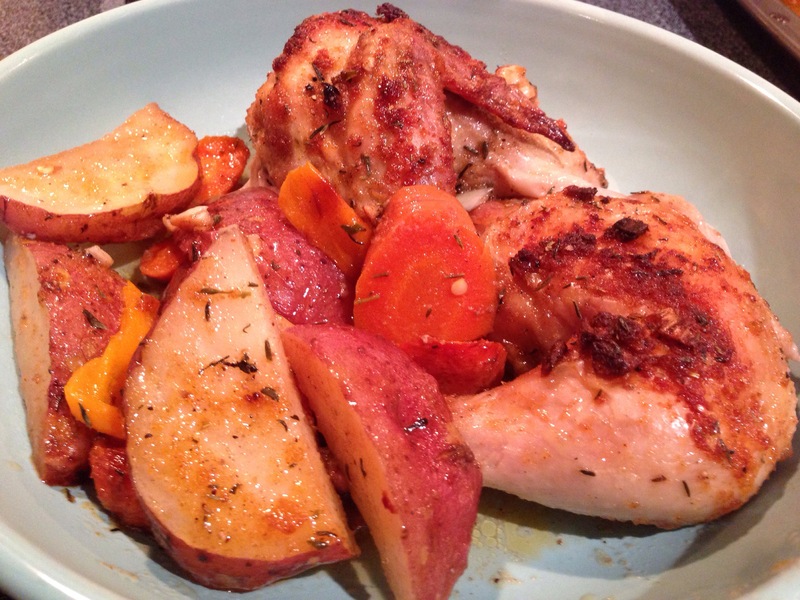 I love Cornish hens, tender and yummy. They are just very young Cornish-Rock meat birds. The birds grow at an unbelievable rate and when they’re a month or so old, they are at game hen size. 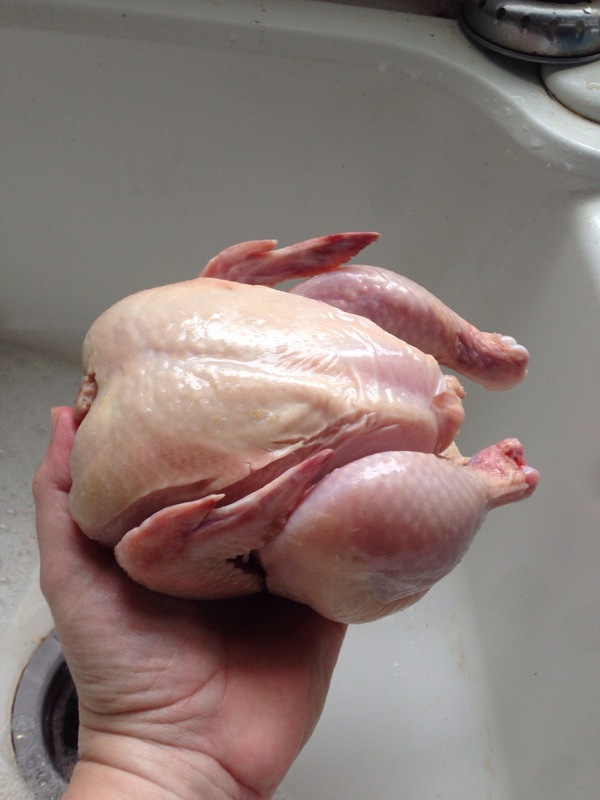 When I raise meat birds I sometimes lose one early through accident or spondylosis and have a Cornish hen to cook.